A family finds mysterious crop circles in their fields which suggests something more frightening to come. On any list of the All-Time Crummiest Songs, 1971’s “Signs” by Five Man Electrical Band merits a high ranking. Along with the film Harold and Maude from the same year, this clunker tune flaunted the worst tendencies of the hippie movement. With its smug extolling of absolute freedom and no recognition of personal responsibility, the track makes me sick. ”Signs” enjoys no connection whatsoever with Signs, the 2002 film from M. Night Shyamalan, but man, do I hate that song! 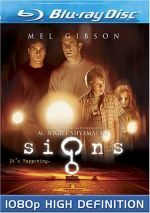 In Signs, we focus on Graham Hess (Mel Gibson), a single father whose wife died in a gruesome car accident six months earlier. A former clergyman, Graham abandoned his faith after her demise. Graham lives with his younger brother Merrill (Joaquin Phoenix), a failed minor league baseball player who could pound the long ball but who struck out far too frequently to become a star. They also reside with Graham’s kids Morgan (Rory Culkin) and Bo (Abigail Breslin). Life in their rural world takes a turn for the weird when the kids discover a massive crop circle on their farm. Initially, Graham assumes that this occurred due to the shenanigans of some local goofballs, but he eventually learns that more extremes powers are at work as additional circles crop up (ha!) all around the world. Many believe that aliens created them, but the firmly earth-bound Graham refuses to accept that until he can’t ignore the signs (ha again!) From there the film follows the actions of the aliens and their impact on Graham and his kin. As far as alien invasion films go, Signs takes a fairly limited focus. We see the outside world only via TV, as Shyamalan maintains a heavy emphasis on how the family deals with the threat. This allows for much introspection as well, as Graham tries to deal with his rejection of God after the death of his wife. All of that sounds pretty heavy, and Signs indeed presents some reasonably deep theological and philosophical issues. None of these receive terrific exploration, but it nonetheless seems refreshing to find a summer blockbuster that even bothers to bring up such topics at all. Not that Shyamalan makes Signs such a think piece that it comes at the expense of fun. He sets up the film in a clever manner that leaves the intentions of the aliens obscure until the last possible minute. Will they offer the gentle, friendly kind found in flicks like Close Encounters of the Third Kind and ET the Extra-Terrestrial or will we find the much more malevolent sorts seen in Independence Day? Shyamalan won’t tell until he absolutely must. Cleverly, he quotes those films fairly directly, which further messes with our expectations. For example, the alien vessels take up residency over the world’s cities in a manner very reminiscent of ID4, while a near meeting with a space monkey in Graham’s fields obviously echoes a segment from ET. This alternating tone helps keep the viewer off-guard and makes the expository elements of the film go by more effectively. Shyamalan also sprinkles the film with some nice humor. Given the flick’s core debate about faith, it needs some comedy, and these moments integrate well with the drama and tension. Shyamalan doesn’t seem to toss them in gratuitously, and they remain so low-key that they never threaten to distract us. Actually, “low-key” may be the best word to describe the film. This works for the fairly stoic community seen in Signs, and I really like the emphasis on the small-scale impact of the alien presence. Rather than go for a global viewpoint, we just see what happens to the Hess family, and Shyamalan nicely avoids the natural tendency to make them key elements in the worldwide reaction to the aliens. Their roles stay local, and that makes the film all the more effective. After all, not everyone will become the person to save the planet. 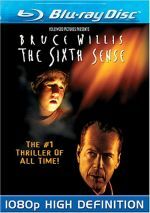 While The Sixth Sense likely will always remain M. Night Shyamalan’s best-known movie, I think Signs provides a more satisfying experience. It provides a solid look at an old subject as it toys with audience expectations. Those components – plus an underlying depth most films in the genre lack – help make Signs fresh and involving. Signs appears in an aspect ratio of approximately 1.85:1 on this Blu-ray Disc. This was a pretty average presentation. Sharpness varied but usually remained acceptable. At times, the picture seemed softer and fuzzier than I’d expect. These instances didn’t happen frequently, and they also didn’t appear major, but they popped up periodically and made the film seem less defined than normal. Neither jagged edges nor moiré effects caused concerns, some light edge enhancement seemed present at times. As for print flaws, a handful of small specks and marks appeared; while minor, they still created some distractions. Colors looked decent. The movie went with a restrained palette and didn’t offer much pop, though it didn’t intend a lot of vivacity. Even within those designs, I still thought the hues were a bit on the bland side. Black levels seemed somewhat wan, and shadow detail was erratic. Most low-light shots showed appropriate definition, but a few others looked a little too dark and opaque. In the end, most of Signs looked positive, but the mix of small concerns knocked my grade down to a more average “C+“. The Uncompressed PCM 5.1 soundtrack of Signs seemed more positive. It presented a soundfield that generally emphasized the forward channels, but it opened up very well at times. The mix showed good stereo music along with a clean and accurate atmosphere from the front. Much of the time, the movie featured simple environmental audio; the low-key nature of the story didn’t require much from the surrounds, though they demonstrated solid ambience during the shots in the fields. The rear speakers added to the film whenever the aliens became more active in the story. Those critters scampered all around the spectrum cleanly and effectively, and those elements helped make the movie creepier. Audio quality impressed. Dialogue always sounded natural and warm, and I noticed no issues related to intelligibility or edginess. Effects appeared lifelike and accurate, with no signs of distortion. Music presented the strongest elements of the mix, as the score appeared bright and lively, with excellent dynamics. Across the board, bass response sounded tight and deep. Ultimately, the soundtrack of Signs fell short of “A” level due to a lack of ambition, but it still worked well for the movie and also sounded great. How did the Blu-ray compare to the original 2003 DVD? Audio was a little richer and fuller, while visuals showed improved clarity and accuracy. While I wasn’t wild about the transfer, I still thought it topped the DVD. The DVD’s extras repeat here, and first we encounter Making Signs, a documentary split into six sections. In total, the whole program lasts 58 minutes and 37 seconds as we hear from writer/producer/director M. Night Shyamalan, producers Frank Marshall and Sam Mercer, executive producer Kathleen Kennedy, storyboard artist/second unit director Brick Mason, production designer Larry Fulton, visual effects supervisor Eric Brevig, composer James Newton Howard, and actors Mel Gibson, Cherry Jones, Joaquin Phoenix, Abigail Breslin and Rory Culkin. Overall, “Making” offers a good look at the production. It covers the film from the beginning, as Shyamalan relates his approach to new projects as well as his take on the concept and some of his influences. We then go through the visual planning for the movie, location scouting, developing the house and crop circles, and other elements. After that, we see elements that relate to specific scenes and different parts of the shoot, and we also get segments that focus on visual effects, the music, and reactions to the flick. I particularly like the parts that explore the creature effects as well as Shyamalan’s requirements for the ad campaign. The documentary seems satisfying and informative. The Deleted Scenes area includes five clips that run a total of seven minutes, 32 seconds. Nothing particularly exciting appears here, though the single long sequence – the five-minute, seven-second “Alien in the Attic and the Third Story” - adds a little more tension of the family’s attempts to deal with the visitors. We find a mix of options in the Multi-Angle Storyboards area. For two different scenes, you can flip between the filmed storyboards and the shots from the final film. You can also select from three different audio options: 5.1 final mix, 5.1 score only, and 5.1 effects only. The first clip – “Graham, the Knife, and the Pantry” – lasts two minutes, 58 seconds, while the other – “Graham and Merrill Chase the Unknown Trespasser” – runs two minutes, 13 seconds. The varying choices make this a nice addition to the set. You gotta give Shyamalan one thing – he’s not afraid to have a laugh at his own expense. Signs includes a snippet of a flick taped by Shyamalan as a kid. Here we find one-minute, 17 seconds of Pictures. The director provides a 60-second intro and then we watch the movie segment itself. When he denigrates the product, he ain’t kidding. This is some hilariously bad stuff, especially due to the presence of the slowest-moving alien threat ever seen. Still, it offers a fun and entertaining extra. The disc opens with ads for WALL-E, Step Up 2: The Streets and The Nightmare Before Christmas. When I saw Signs theatrically, I found it offered a pleasant surprise in that it seemed more tense and exciting than I expected. Signs holds up well to an additional viewings, as it continued to present a taut and well-executed tale. The Blu-ray offers average picture quality along with very good audio and some useful bonus materials. I wish we got a more impressive visual presentation, but the Blu-ray is generally pretty good and I like the movie quite a bit.